It seems designing a fresh new start-up or blue-sky innovation project gets all the limelight in the media these days, meanwhile, globally, companies spend (conservatively) somewhere around US$60B on custom-built applications every year, and this trend continued in an upward trajectory for decades. The problem is that these applications have long lifespans, and tend not to age gracefully. People’s expectations of user-experiences are so far from what these applications offer, yet the investment in the underlying technology is high and the business processes these systems encapsulate can be very complex. So how do you effectively go about redesigning the user experience of a legacy system? This post shows three ways you can use Design Thinking to better understand how and why you should redesign the user experience of your legacy applications. But First, What is Design Thinking? Even though Design Thinking gets a lot of publicity, the ideas behind DT are not new or unique – there are many ‘frameworks’ for supporting creative thinking such as Creative Problem Solving and Triz. What Design Thinking does provide is a simple set of activity stages that we can then apply specific activities to obtain a new level of insight. The skills we use to understand the current reality of user experience all fall into the first step of the Design Thinking process: Empathise. In the context of Design Thinking, the empathy phase is actually performing two important activities for the participants in the Design Thinking process: first, it builds an understanding of the human experience of the business problem, and second, it builds the participants mental models of the business itself. Gerardo Velasquez, Thinking.Studio lead UX designer. Forcing participants in the Design Thinking process to gather and absorb the information about the intention of the business process, the experience of the system, and the business system itself is a form of disfluency. I was first introduced to the concept of disfluency in Charles Duhigg’s fantastic book Smarter, Faster, Better and I have found that applying this concept forces vastly deeper understanding. Empathy cannot be done at a distance. As a participant in a project to transform the experience of some custom business software, you need to spend time with actual people who use the current system. If there is some way participants can undertake that same process as the user under their supervision it’s even better. Live in their world and feel their pain. The legendary A.G. Lafley, former CEO of P&G was adamant that managers should spend time living with families that used their products so they could develop insights through empathy. The results speak for themselves, within a decade under Lafley, the company’s value increased by more than $100 billion. Map the organisational context, not just the experience – who is who’s boss? Who reports to who? What is the ambient environment like? The inherent problem with a ‘pure empathy’ approach is that there are so many opportunities for cognitive biases to creep in that skew the insights. Furthermore, given the nature of the empathetic approach, you are generally dealing with a very small sample set. If it is at all possible, quantitative data gathering should also be undertaken on the existing system to help provide some contrast to your observational insights. Implementation of data-gathering could be as simple as finding the IT administrator and asking them for access to the analytics, or it could mean setting up a new analytics account and embedding some tracking code into the pages of the legacy application, or it may mean temporarily deploying a ‘tracking proxy‘ that can track the application without needing modification to the original application. Heat-maps show mouse movement and click behavior of all – or subsets – of users. 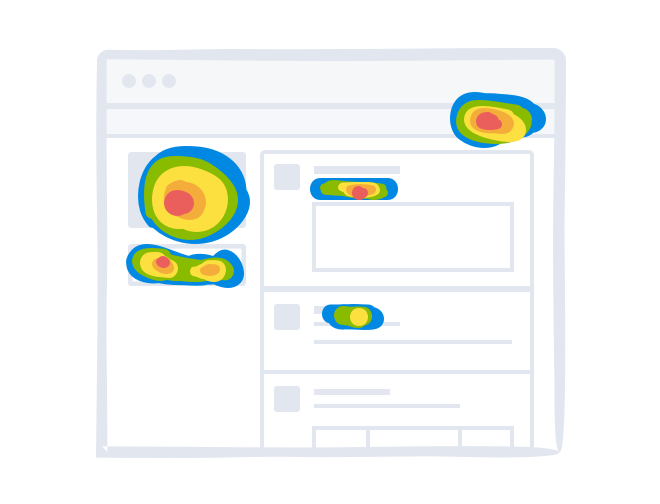 A heat-map can provide a level of understanding about aggregate user behaviour that is impossible to achieve any other way. During the empathy stage, we often fail to consider that there are many perspectives. End-users will have many varied perspectives on any given system – so when we take the time to get more than one perspective, we often fall into the trap of only considering end-users of a system as being the only group with which we need to develop empathy. What about the other stakeholders? To really understand the organisational context and develop deep empathy we must spend time with management and the designers of the original system we are seeking to modernise. Why did the organisation create this business process? What were they trying to do when they then created this business system? What were the engineering team considering when they implemented the solution? Did they understand the business process? What were their implementation constraints? These different perspectives, combined with a personal exploration of the system. Time to further develop our understanding of the system, the current experience of implementing the business process using the current business system as well as the broader business context. Design Thinking is a great approach to structure the re-design process for a legacy business application. However, there are some further ideas you can apply to gather a deeper level of insight.